Multani Mal Modi College has won the Inter-College Table Tennis Championship (Men) held at Desh Bhagat University, Gobindigarh. The winning team comprised of Abhinav Gulati, Gursimaran Singh, Gagandeep Singh and Charanjeet Singh. 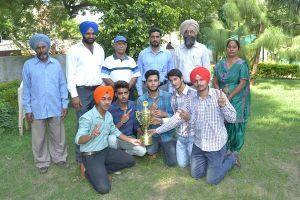 The college Principal, Dr. Khushvinder Kumar and Dr. Gurdeep Singh, Chairman, Sports Committee of the College, congratulated the winning teams. The Principal also applauded the sincere efforts of the teachers-in-charge of sports activities, Prof. Nishan Singh and Ms. Mandeep Kaur. The Principal honoured the team coach Sh. Varinder Gulati. The Principal said that these sportspersons will be duly rewarded during the Annual Prize Distribution Function of the College.